The shop is open daily from 9:00am to 11:00am and 5:00pm to 8:00pm. We stock a variety of camping essentials, gas refills, stoves, electric hookup cables, pegs and more. Feeling hungry or thirsty, we have you covered! stocking a large selection of snacks and soft drinks. The Speyside Gardens team are onsite all season to assist you with any help you might require during your stay with us, our Warden is always looking to make your stay more enjoyable. Keep the little ones entertained on this great jungle gym, set on the lovely green close to the red squirrel feeders. 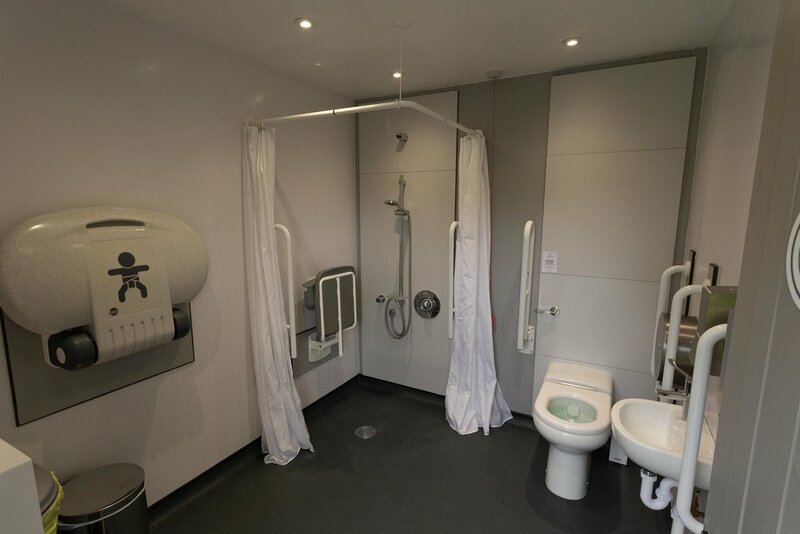 There are onsite ladies and gents toilets and private family bathrooms and shower rooms, with underfloor heating to keep your toes nice and warm! There is a spacious Disabled/Family Room which has a shower, sink, toilet and baby changing unit. We also have a washing up area with hot water and five washing up points for our campers to use and a chemical disposal point which is always available. The laundry has two coin operated washing machines, tumble dryer and ironing point. There is plenty of work surface space for laying out clothes once ironed, and also a double sink for any hand washing requirements you might have. We also have an outside area for drying your clothes on our communal clothes line.